If you love cherries for a good aromatic flavour, then 'Regina' is for you!! Especially in this patio form. Flattish, dark-red fruit in June and July each year following pure-white spring blossom. Each has deep-red flesh that tastes incredible whether eaten fresh or used in cooking. Supplied as a 1-1.2M tall, grower quality, potted tree. Will grow to approx. 2-2.5m (7-8ft) in 10 years. Fully winter hardy. 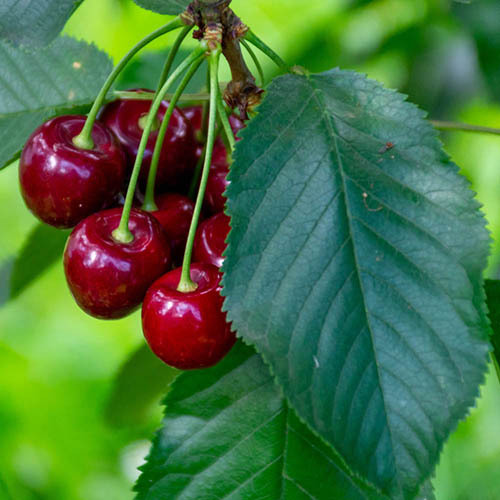 If you love the taste of cherries, the classic sweet cherry aromatic flavour of Cherry ' Regina' is the variety for you to grow in your garden! It produces its slightly flattened, dark-red fruit in June and July each year after the pure-white spring blossom disappears, each one with a deep-red flesh that tastes incredible! This top-quality self-fertile tree is grown on a very dwarfing rootstock so it will happily and reliably produce its bumper crops each year, but remain compact enough for you to grow it in your garden ata maximum of 2-2.5M tall! A real garden winner.. Supplied as a 1-1.2M tall, grower quality, branched tree pot grown in a 5L pot. Grown on very dwarfing Gisela G5 rootstock, so maximum height 2-2.5M.